Ken Dryden has accomplished a lot in his life. He graduated from Cornell, enjoyed a successful career as a lawyer and businessman, was a three-time Olympic broadcaster and currently is Member of Parliament in Ottawa. Oh yeah, and he had a Hall of Fame hockey career where he won 6 Stanley Cups in 8 seasons and is considered one of the greatest goaltenders in the history of the game. He also somehow found the time to write 5 books, including The Game, universally regarded as the best hockey book ever written. Since losing out on a Liberal Party leadership bid in 2006 he has been somewhat quiet, at least on the national political scene. But he's back making headlines, thanks to the release of his new book. Becoming Canada is very much about politics. Dryden lays out his vision of a new nationalism, a new way of seeing this country that leaves behind the tired cliches of our past and embraces the modern and incredibly diverse country that Canada has become. That means putting aside our traditional French/English divide and our anti-Americanism. He wants us to embrace being "the most global country in a global world." "We have paid a huge price for having the wrong sense of ourselves as a country," he writes. "It has forced us to live under a ceiling of expectation and ambition that is so far below what we can do and can be." 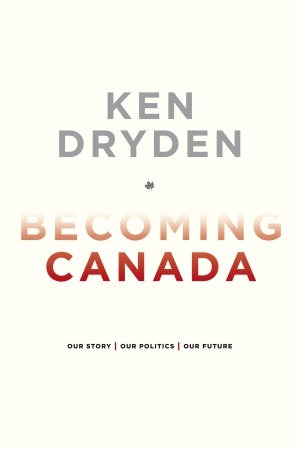 Dryden does not necessarily define what Canada should be, but engages readers to enter into the debate so that we can collectively move forward. Dryden has several lifetimes of accomplishments in his 60-plus years. He has always had a grander vision of everything than all of us. If he can engage enough Canadians and especially enough politicians to act on their vision of Canada's future sooner rather than later, this could be his most important contribution yet. By the way, this is not Dryden's first venture into writing about subjects other than hockey. In 1995 he looked at our education system in In School: Our Kids, Our Teachers, Our Classrooms. Two years earlier than that he tried his hand at fiction with the novel The Moved And The Shaken. Ken Dryden discusses new book on Fan590 radio .